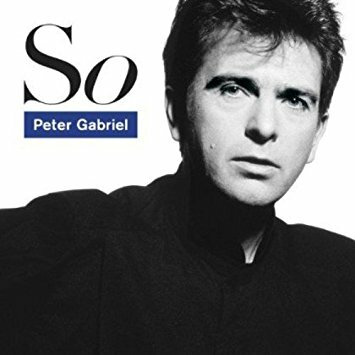 Anyone who saw or heard Peter Gabriel’s performance at the recent Amnesty International concert must admit that he was one of the show’s major treats. Two of the songs he performed, “Red Rain” and “Sledgehammer”, are included on his great new album So. The music on So ranges from powerful funk (“Sledgehammer”, “Big Time”), to delicate introspection (“Red Rain”, “Mercy Street”). Gabriel has utilized the talents of people like drummer Jerry Marotta, bassist Tony Levin and pianist Richard Tee on So and is also joined by a number of special guests. Kate Bush adds her distinctive vocals for a duet on “Don’t Give Up’, and Jim Kerr of Simple Minds does background vocals on “In Your Eyes”. Senegalese rock star Youssou N’Dour also sings on the latter track. Police percussionist Stewart Copeland plays drums on “Big Time”, and high-hat on “Red Rain”. Produced by Daniel Lanois (Parachute Club), So proves again that Gabriel is by far the most creative musician Genesis ever spawned. Compared to the run-of-the-mill pop that Phil Collins and Mike (Mike & the Mechanics) Rutherford have been producing lately, Gabriel is making magic. And what about that “Sledgehammer” video!